After a series of successful conferences organized by the Post Graduate Student Society Faculty of Science (PGSSFS) and Faculty of Science in collaboration with the School of Graduate Studies (SPS), the annually held International Science Postgraduate Conference (ISPC) returns once again for the sixth time coming May 2018 but with a bigger twist! Re branded as the UTM-Emerging Scientist Conference (UTM-ESCon), this time around the conference is not only expanding its scope but also offering a virtual conference enabling more participants to join the conference without the hustle of travelling and time restriction. 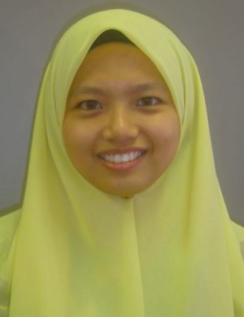 Being a continuum of its predecessor, ISPC was initially organized to serve as a platform for fellow postgraduates specializing in the field of science to share their findings and works thus its name International Science Postgraduate Conference. Today, we undoubtedly have reached out to more than just postgraduates as each year opens up to more submissions thus initiating re branding in line with the evolution. after going through the normal reviewing process. Manuscripts that are not selected in the above journals are invited to be published in the UTM-ESCon 2018 Conference Proceeding (with ISBN number from the National Library). Further details and submission details can be obtained on our website http://people.utm.my/escon18. 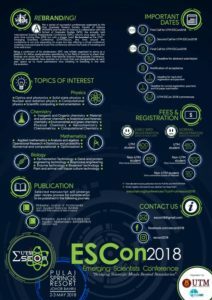 In case of queries, do not hesitate to contact us via email at escon18@gmail.com.